Okay, this is INCREDIBLY more complicated than it needs to be, and I could not find anything on the Wordpress.com or Wordpress.org help forums that would help me answer this question. I ended up spending an hour on live support with the company that I paid to reserve my URL, Namecheap. And I spent another hour going through the Wordpress forums on wordpress.org and wordpress.com. And I kept finding articles that were…well unhelpful. About a year ago, I purchased a domain “www.jonathanmaimon.com” from NameCheap, at $13/year. I had to build a website. I put together a Wordpress site using the Edin theme which was a basic, free theme that would be a good start for the first draft of my portfolio. A mentor of mine told me making my first portfolio draft should be as quick as possible. I wanted to keep it quick, add my name, my work examples, and how to contact me. It should take eight hours. Unfortunately, it took longer than eight hours. A lot of time went into collecting all the supporting documents, writing the stories for each project, including what I set out to do and what I achieved, cropping images, and formatting images, to name a few. But I finally finished it, and received the approval from my clients. Now, I was ready to do the seemingly simple thing of connecting my domain, www.jonathanmaimon.com with my Wordpress domain www.jonathanmaimon.wordpress.com so that everything appears under one URL of www.jonathanmaimon.com. It’s more complicated than I thought, but I’m going to lay out all the steps you need in the piece below. 1. For $13/year, add the custom domain you already own to Wordpress. Go to your Wordpress dashboard and find Configure -> Domains. You’ll have the opportunity to type in your custom domain. Then you follow the instructions and submit payment to Wordpress. 2. Lookup your Wordpress site’s IP address. My wordpress site is www.jonathanmaimon.wordpress.com. I couldn’t find my IP address listed anwyhere on my Dashboard. I’m sure it’s somewhere, I just couldn’t find it. The Wordpress help site was not useful. They told me to contact their customer support team to get this information. It will tell you the IP address for any site on the Internet. 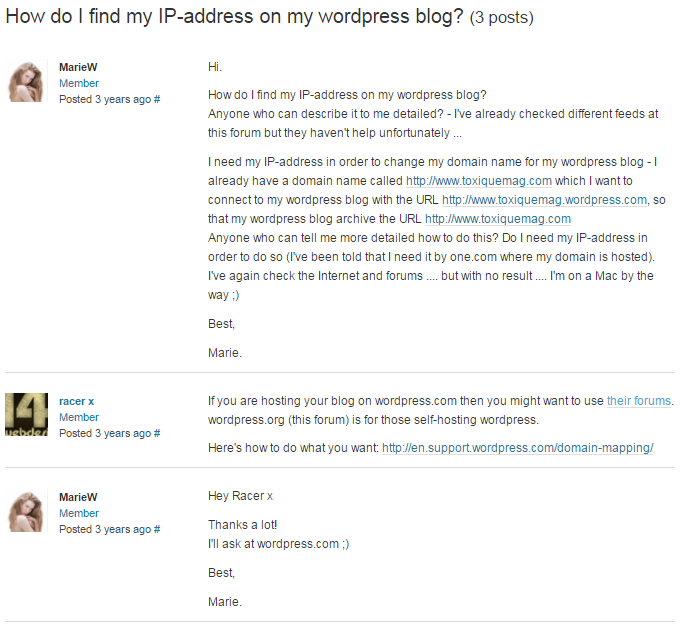 That’s where I found out my Wordpress site’s IP address. 3. Log in to your domain registrar to map your domain to your Wordpress site’s IP address. I did it a little differently, based on my hour-long conversation with their customer support team. I’m going to detail below what I learned from that conversation and what worked for me. Log in to your registar. Find something that says Advanced DNS. You’ll choose a record type from a dropdown menu. Select “A record”. Continue filling in the information. For host, type“@”. For the IP address, type the value you looked up earlier, so for me this was “192.0.78.12”. Create two “A records”, one with host “@” and one with host “www”, in order to map your site properly. Important: Remove ALL other records, the ones already there, otherwise your new mapping might not work properly. It might take a couple minutes for these changes to go live. 4. Make your custom domain your primary domain on your Wordpress site. Go back to the Domains page on Wordpress. You’ll see two domains. Choose the second domain, the one you just “Mapped ”, and follow the instructions to make it your Primary domain. Voila. Now jonathanmaimon.com is now my primary domain. Test it out. And be sure to leave me a reply if it didn’t work out for you. Designer. UX researcher. Ex-Finance Professional.